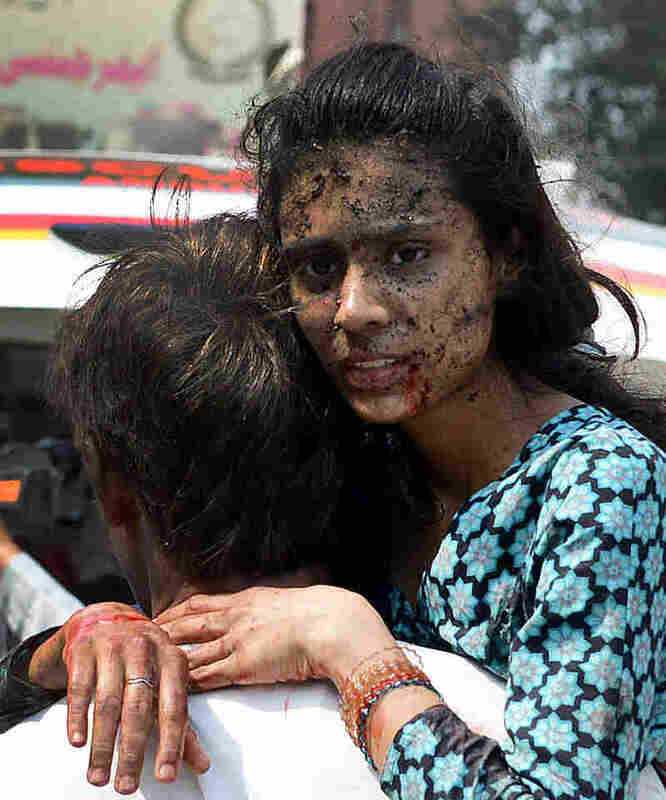 Death Toll In Pakistan Church Attack Reaches 85 : The Two-Way Two suicide bombers stuck a historic Christian church in the country's northwest on Sunday. Groups linked to the Taliban have claimed responsibility. A woman is carried into the hospital after being injured when two suicide bombers attacked a church in Peshawar, Pakistan, on Sunday. At least 85 people are listed as dead in northwest Pakistan after what's been described as the largest-ever attack on the country's Christian minority. A pair of suicide bombers blew themselves up Sunday at the historic All Saints Church in the city of Peshawar, not far from the Afghan border. The BBC says two groups with ties to the Pakistani Taliban have said they ordered the attack in retaliation for U.S. drone strikes. "Angry Christians blocked roads around the country to protest the bombings. On one of the main roads coming into the capital of Islamabad, demonstrators burned tires and demanded government protection for the members of the Christian minority." On Sunday, protests took place in Peshawar, Lahore, Karachi and the capital, Islamabad, according to the BBC. More demonstrations were expected on Monday. "[The] bombings raised new questions about the Pakistani government's push to strike a peace deal with the militants to end a decade-long insurgency that has killed thousands of people." Speaking with NPR's Morning Edition on Monday, Vali Nasr, the dean of the Johns Hopkins School of Advanced International Studies, said the Christians and minority Muslim sects have been frequently targeted by groups belonging to Pakistan's Sunni Muslim majority. "There have been issues regarding Christians, including an assassination of a minister of religious affairs who was a Christian, including application of the very controversial blasphemy laws against Christians," Nasr tells host Steve Inskeep.